GOP presidential candidates are endorsing torture, again. For anyone who cares deeply about being informed, watching Republican presidential debates can feel like a form of torture. But the program becomes more terrifying altogether when their ignorance is hitched to an endorsement of actual torture. At the latest GOP debate in New Hampshire, Donald Trump heartily endorsed waterboarding and other forms of torture, which he promised to reinstitute in national security interrogations if he wins the election. "I would bring back waterboarding, and I would bring back a hell of a lot worse than waterboarding," Trump vowed. Trump's position was condemned immediately by Republican Senator John McCain, who knows a thing or two about torture. McCain, who was brutally beaten as a prisoner of war in Vietnam, accused his fellow Republicans of "sacrificing our respect for human dignity" with their "loose talk" about instituting human rights abuses. McCain reminded Trump -- and Republican presidential candidates Ted Cruz, Marco Rubio, and Carly Fiorina, who also seem to be enamored of torture -- that the torture techniques employed by the Bush administration after 9/11 were unreliable. They produced no actionable intelligence, disrupted no terrorist attacks, and saved no American lives. These conclusions were documented by investigators for the Senate Intelligence Committee, who examined raw CIA documents. In other words, they came directly from the horse's mouth. 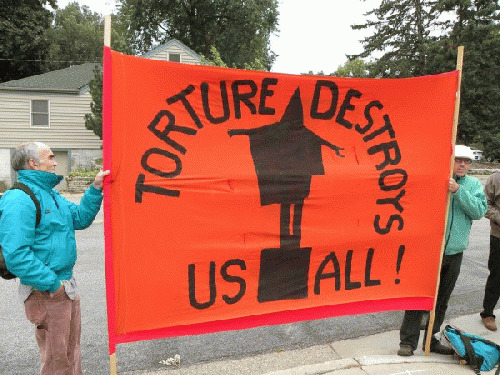 But torture isn't just bad policy. It's against the law. First, the federal Torture Act stipulates that if an American soldier, CIA officer, or anybody else acting on behalf of the government waterboards a prisoner, he risks up to 20 years imprisonment. The McCain-Feinstein Amendment Congress passed last year reiterated the ban on torture, including waterboarding. Second, our country is a signatory to the United Nations Convention Against Torture. Waterboarding a prisoner is against international law and could subject the torturer -- or the person ordering or approving the torture -- to international sanctions, including prosecution in international courts. In the early part of the last decade, torture fans in the George W. Bush Justice Department -- most infamously in a legal opinion by attorneys John Yoo and Jay Bybee -- twisted the law itself into contortions to argue that certain forms of torture were permissible. Al-Qaeda, they said, was a "non-state actor," not a country. As such, its members should receive none of the protections of international law. That argument was specious on its face. Absolutely nothing in U.S. law says that there are two sets of rules -- one for countries and one for terrorist groups. The law is the law, whether we like it or not -- including international conventions adopted by the United States. What Trump and his cronies are advocating is illegal, immoral, and unconstitutional. In fact, it's an impeachable offense. No president can order anybody to commit torture. Anyone who does should be hauled before a judge. Personally, I have trouble taking any candidate who knows so little about the law and the Constitution seriously. But deep down, I almost want one of them to win, just so Congress, the Supreme Court, and the American people can make an example of him or her. Maybe that's what it will take to finally put this torture issue to rest.